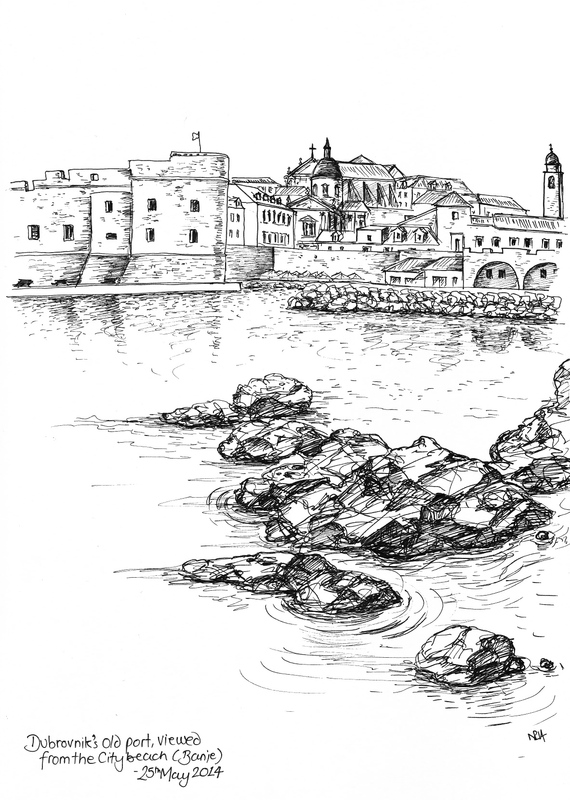 My third and final post sharing extracts from my progressively filled new sketchbook are those pages which I sketched while on the beach adjacent to the old walled city of Dubrovnik. I was a little reticent at first to take my sketchbook on the beach – I envisaged grease splodges from suntan cream and grains of sand getting into the binding. But then owing to the unique position of Dubrovnik’s beach right next to the city affording views over its world-recognisable skyline, who could resist? And so taking extra caution with my sketchbook, I stretched out like a sun-loving cat on my lounger and propped my sketchbook up on my knees and drew. 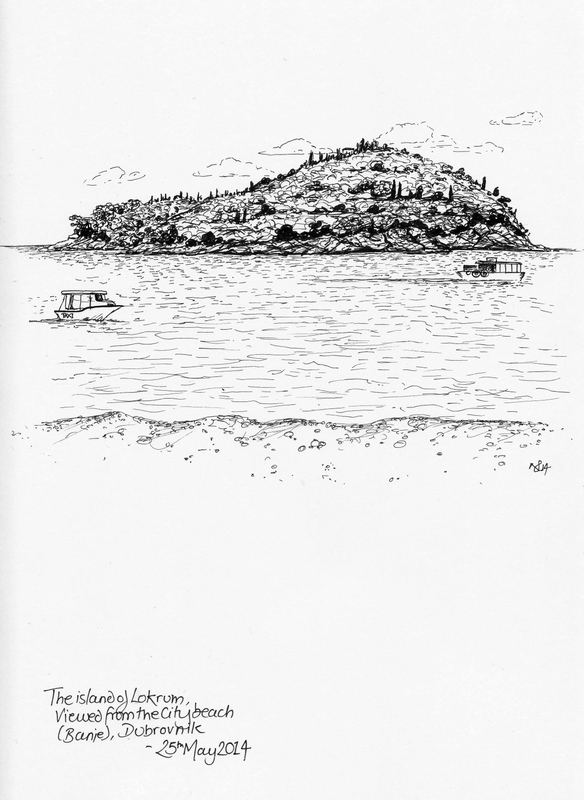 My first sketch is not of Dubrovnik itself, but of the verdant island of Lokrum which sits bang opposite the city out at sea and is covered all over with a lustrous growth of greenery. The island is mysteriously beautiful, and while its green colour may not come across in my black and white sketch, hopefully the texture of its rich vegetation does. For my second sketch, I departed my lounger and went to sit on a nearby rocky pier which affords the most perfect views of the city beyond. And it was this incredible view that I sketched that afternoon, taking a good 20 minutes or so sketching the various details of the city, and getting myself a royally sunburnt shoulder in the meantime! I’m delighted with these first attempts at proper on-site sketching and miss the very process of taking out my book to start a new scene afresh. But I’m sure that this summer will provide further inspiration for me to fill those pages – and you can be sure that whatever I draw will feature on The Daily Norm!